UEFA Euros - live stream, odds, results, stats and fixtures! The UFEA Euros 2020 will be the first European Championship to be held across the continent for the first time in the competition’s 60-year history. In all, there will be a total of 12 host cities and as many arenas. The concept from the 2016 UEFA Euro will be kept, with 24 participating teams instead of 16 as it has been in earlier tournaments. Portugal are the defending champions after winning the 2016 edition. This section will be updated with odds for the tournament as soon as they are available. Since the 2020 championship will have several host countries, none of them will be qualified automatically. So there is a chance that some of the hosting countries won’t qualify for the final tournament. This means that all 55 UEFA nations will compete for the 24 spots in the final tournament. The 2020 UEFA Euro qualifiers will run from March to November in 2019. The 55 nations will be split into ten groups of five or six. The top two teams from each group will advance to the final tournament, which will fill 20 of the spots. The final four spots will go to the winners in the new play-off system linked to the UEFA Nations League. Nations League is a brand new tournament, which offers another way into the 2020 UEFA Euros. The four remaining spots to the final championship will go to the top four teams in Nations League. In theory, the 16 winners of the groups in Nations League will reach the play-offs. But if one of the group winners have already qualified through the European Qualifiers, their spot goes on to the next best-ranked team in their league. The four best teams in the Nations League play-offs, which will be played in March 2020, will take the four final spots in the 2020 European Championship. 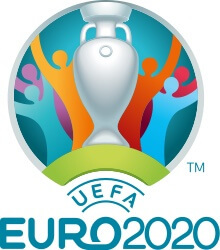 The Uefa Euro 2020 will be hosted by a total of 12 countries. These are England, Azerbajian, Germany, Italy, Russia, Netherlands, Spain, Romania, Hungary, Denmark, Republic of Ireland and Scotland. This means that the championship will be played all over Europe, with the final being played at Wembley Stadium in London, England. All host countries that qualifies to the final tournament are guaranteed to play at least two of the group stage matches at home. The qualifiers for the 2020 European championship will begin on March 21st 2019. The final tournament will then begin with the opening game on June 12th 2020. That game will be played in Rome, at the Stadio Olimpico. The group stage will be played with between two and four matcher per day until 24 June. The round of 16 will then begin on June 27th. The quarter-finals are scheduled to take place on July 3rd and 4th. The semi-finals, as well as the final, will be played at Wembley in London. The first semi-final will be played on July 7th, and the second on July 8th. After that, three rest days awaits. The final is played at Wembley Stadium at 21:00 CET on July 12th. Here at Odds Expert, we’ll keep you posted with all the latest around the 2020 UEFA Euros. We post news about draws and other interesting events, and will of course follow the qualification as well as the main tournament. The complete schedule will be available on this page, as well as result from previous matches and statistics for the participating teams. We also offer two tools that will help you find the best UEFA Euros odds. The first one is our Odds Comparison, where you’ll find odds on the matches from a number of different betting sites online. That way, you can easily find which bookmaker offers the best odds on specific matches. If you want to place combination bets on several matches, we recommend you to use our Bet Mate tool. Place the bets you want to make in the basket, and the Bet Mate will find which betting site offers the best odds on that specific combination. It doesn’t get easier than that! If live streaming is available from the matches, we will of course update you with that as well.